I keep hearing about this place. 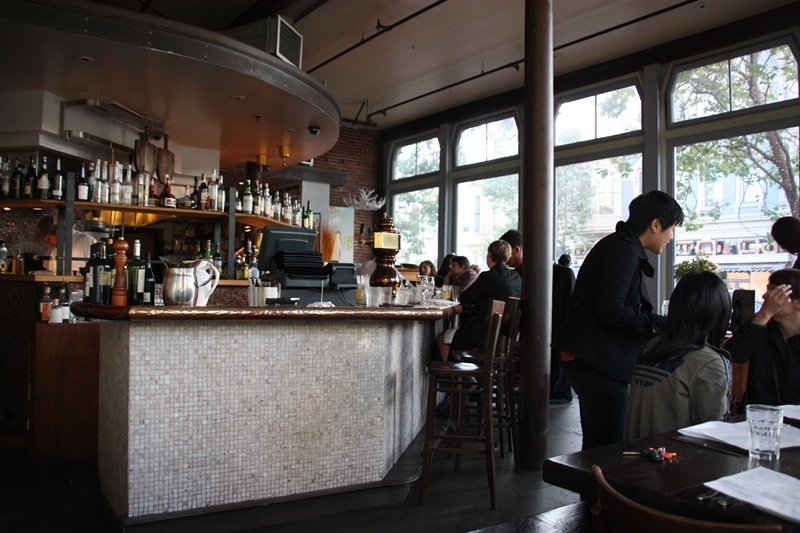 It’s at 29th and Telegraph in Oakland, and it’s a pub/cafe-type place that my friends like to go for Sunday brunch. And it’s awesome. I finally went today and thoroughly enjoyed myself. From the adorable pair at the bar speaking in their British accents (which I hope were real) to the decidedly British/Aussie (hence the name Commonwealth) fare and beverages (beans and toast, “cuppa” tea), this place was A) uber-cute, and B) good. We three ladies ordered three dishes and shared. And the light was fabulous so my photos look money. See? 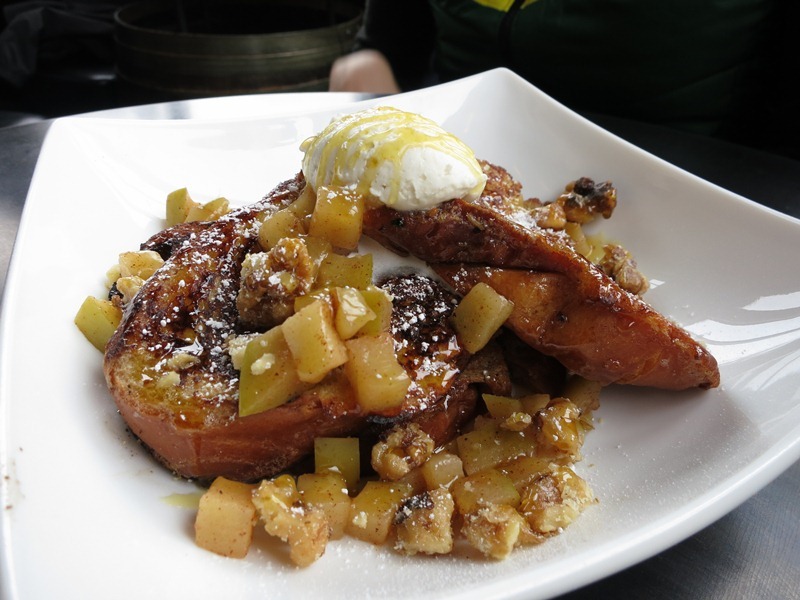 French toast with “Golden” syrup. You know you want it. Atmosphere: 3/5 ♦ Service: 3/5 ♦ Food Quality: 2/5 ♦ Value: 3/5Times Visited: One ♦ Will I Return? : Unlikely. No, my keyboard did not break one letter into writing the title of this post. The proprietors of B Restaurant in Oakland apparently decided their time could be better spent on things other than coming up with an extravagant name for their establishment. B boasts floor to ceiling transom windows which give the space a modern open feeling. You can enjoy the view from the windows while sitting at the contemporary bar that serves a full range of cocktails…. So, what’s been happening? Have you found other better blogs to read? Undoubtedly. 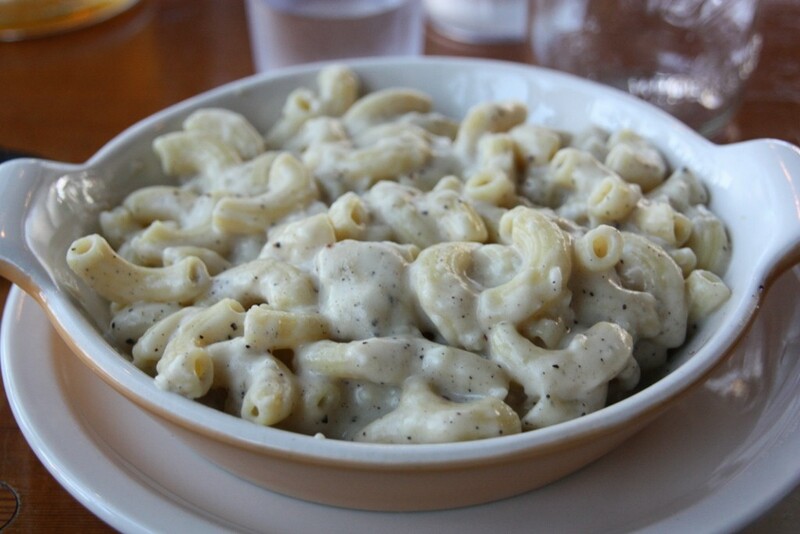 Anyway, I’m typing today about one my favorite foods: macaroni and cheese. 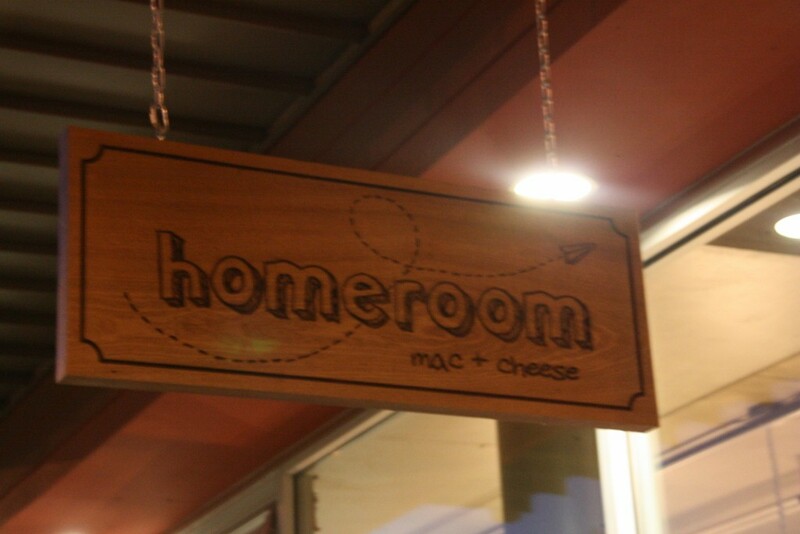 There’s a new mac and cheese restaurant in Oakland called Homeroom and it’s all the rage lately. I’ve heard people talking about this place nonstop since it opened a few months ago. It was time for a try. Some friends and I met up at Homeroom after work a couple weeks ago when it was super duper hot outside. The day was beautiful, but Homeroom has no air con. Which would normally be fine, but that day meant that we were a sweating, hungry bunch. And then we ate some hot, dense mac and cheese. It was not the best plan (ex: milk was a bad choice), but we made the best of it and still enjoyed ourselves. 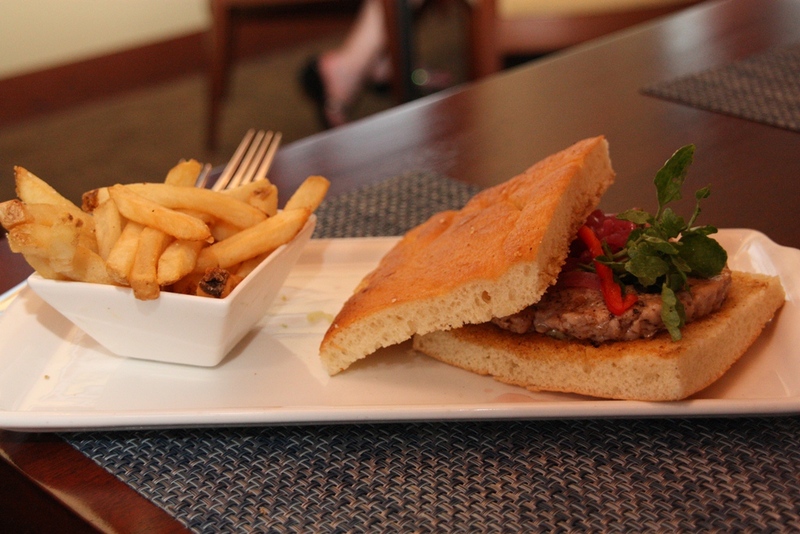 And it would have been a great day to enjoy one of their few tables outside (but we didn’t want to wait). The space is smaller than I expected, for some reason, but is decorated with cute and artsy items all revolving around a school/learning theme (we were in Homeroom, after all). 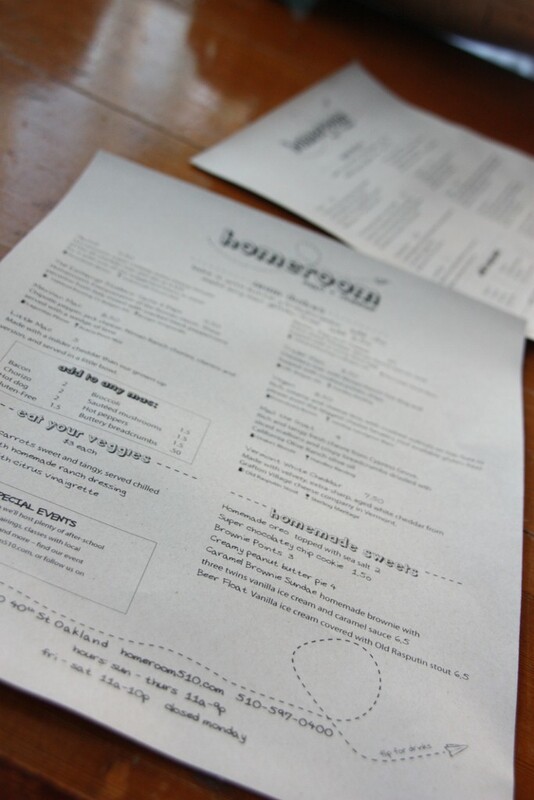 The menu is a single page of paper with instructions on how to fold it into a paper airplane on one side, in case you feel so inclined. The choices are basic: 8 types of mac and cheese, a few sides of veggies, a handful of desserts, beer (including on tap), wine, and other drinks. I really appreciated the simplicity and easily made my decision to reminisce about Rome with the “The Exchange Student: Cacio e Pepe” and a side of carrots. Cacio e Pepe mac and cheese wins! Is it pronounced like what a cow says (mooo-a) or the way you say “me” in French (excusez-moi)?? I don’t know and, frankly, it doesn’t much matter since you pretty much get the gist either way. 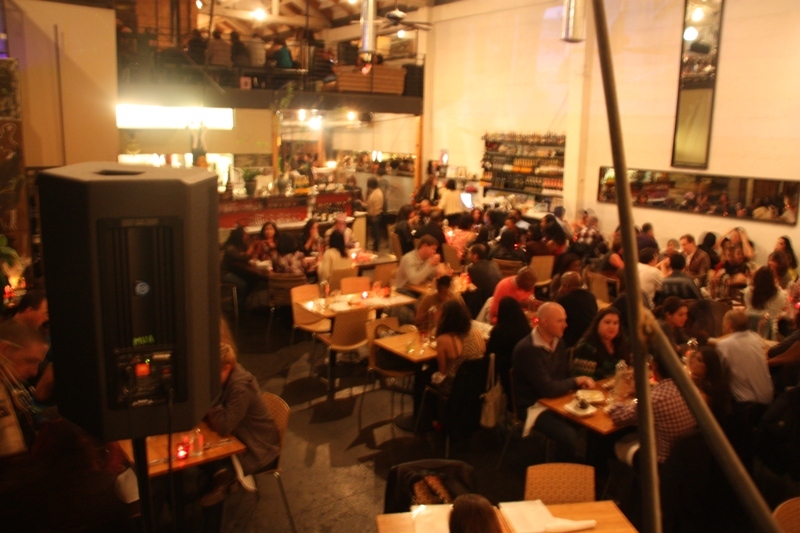 However you want to say it, Mua is located on Webster Street just next to 25th and Broadway in Oakland. This is one of these in-between neighborhoods that’s slowly growing to add to Oakland’s awesomeness — there are a some vacant building and unidentifiable/run-down businesses mushed in with sweet converted lofts, tiny art studios and chic restaurants and bars. Mua sort of dabbles a bit in all three of these latter fab categories. The main seating area of Mua seen from the stairs up to the mezzanine. Coach can be found at 532 Grand Avenue in Oakland along an increasingly nice strip of shops and restaurants around the lake. Between the few strikingly crazed homeless folks and odd smell wafting from special parts of the lake, this area is extremely nice. And it’s nice enough currently to draw joggers, dog walkers and a plethora of normal people to make a visit wholly worthwhile and enjoyable. 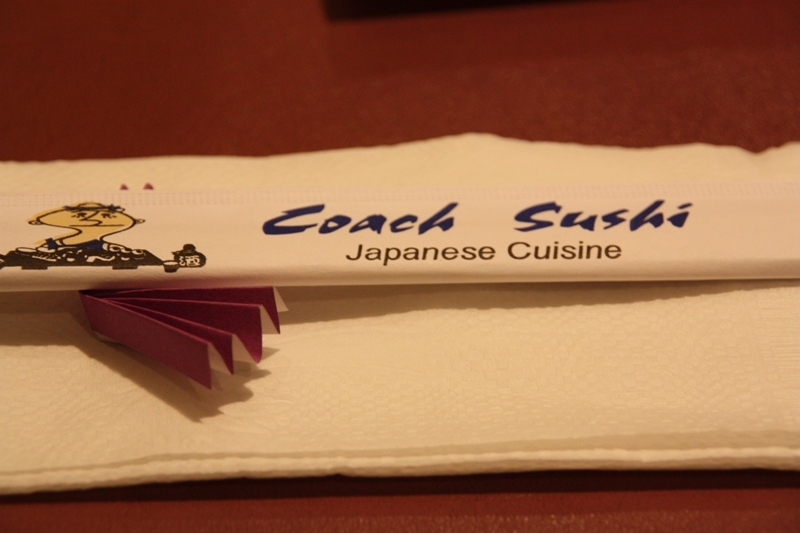 After a loop around the lake, our double-dating group settled on Coach Sushi for dinner, to which none of us had previously been…. 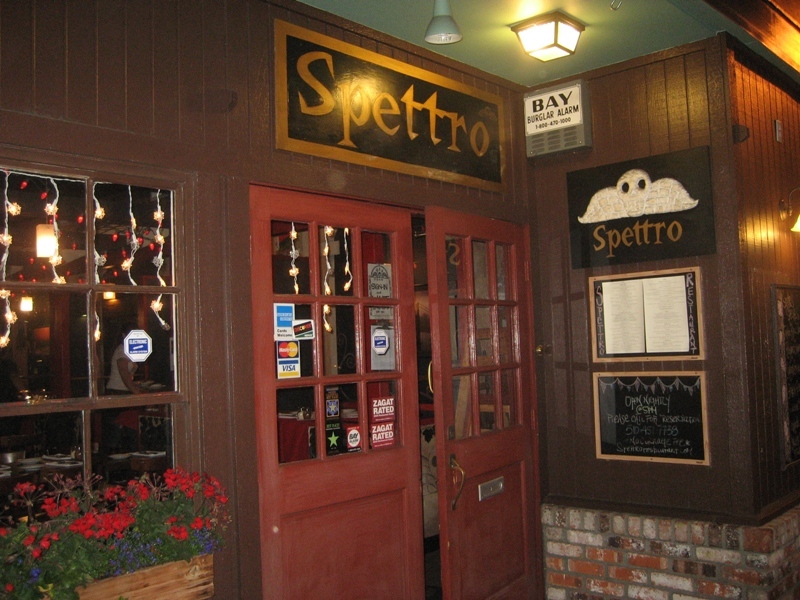 Spettro can be found at 3355 Lakeshore Avenue in Oakland and is one of a huge many awesome restaurants which I’m only just finding out about in this area. 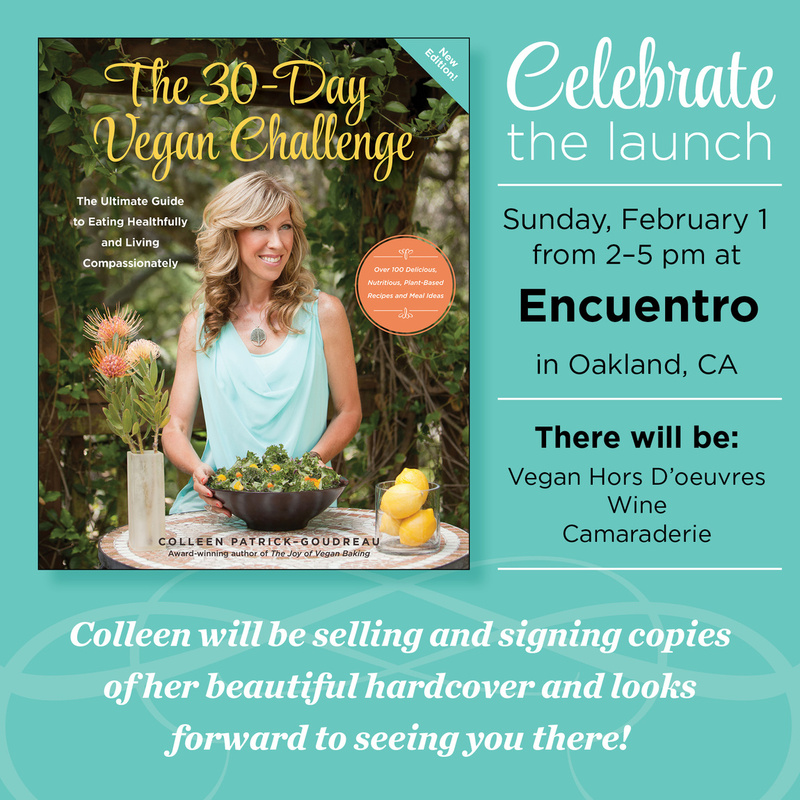 Seriously, Oakland is pretty awesome. Our friends described this place as Mexican/Italian fusion, but after seeing the menu, it pretty much looked like Italian to me. A variety of delicious-sounding salads; entrees including chicken marsala, chicken or eggplant parmesan, oven braised lamb and chicken risotto along with pastas and pizzas will start any mouth watering. Seriously, it was super hard to choose between the salads and the pizzas…so Friend #1 and I split one of each. 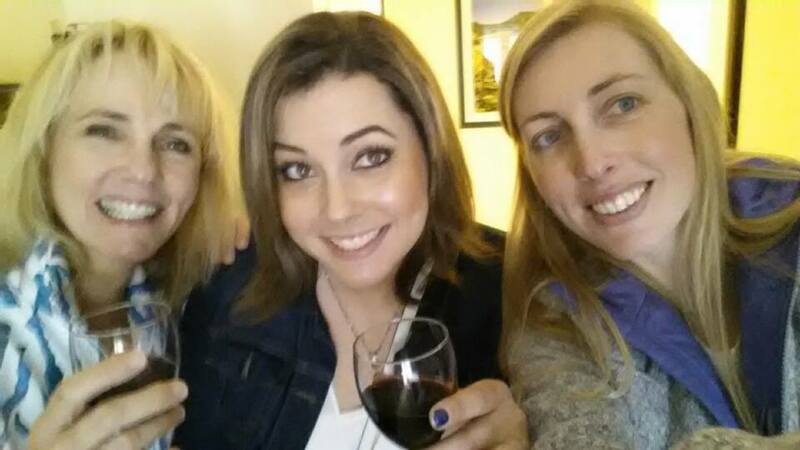 This was a fabulous choice….